Lighting director, Colin (Willy) Williams, on the set of the Australian motion picture film, Summer Coda, in Buronga, NSW. The Gaffer or Lighting Director is one of the most important people on a film set. Working closely with the Director of Photography (DOP) the Gaffer is responsible for lighting the scene and, as a consequence, contributing to the mood explored in the art that’s created. The Australian motion picture film, Summer Coda, was fortunate indeed to have the services of Colin (Willy) Williams as lighting director. With over 30 years in film and television Willy’s experience, good nature and professionalism was greatly appreciated by all who worked under the oppressive heat during those long hot November and December days and nights that filming took place. While working on the film as the stills photographer I was fortunate to chat with Willy about some of his experiences in the industry and the people with whom he’s worked. I made the above picture of Willy while he was making careful adjustments to a light positioned on a lawn and directed, through a window, into a wonderful home. This particular house is situated in the midst of a vineyard and orange grove just outside the town of Buronga in far southwest New South Wales, Australia. A close inspection of the image will reveal the Decisive Moment at which the image was made. Willy’s expression, particularly evident in his eyes; the position of his body; and the light on his face made this the kind of candid image I just had to make. 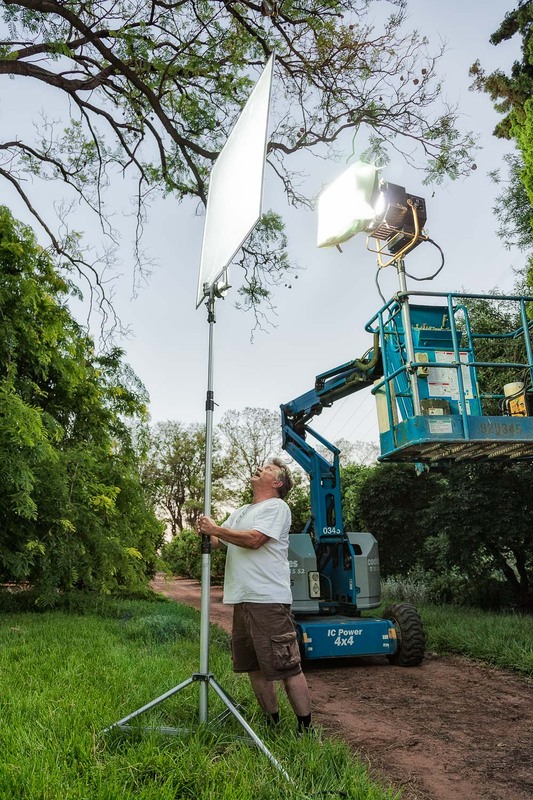 Lighting assistant Birren adds diffusion to a bank of fluroescent lights on the set of Summer Coda on a farm near Buronga in NSW. I made this image of Birren, in the middle of very hectic activity, during which time members of the crew were busy settling up for filming indoors. This involved a number of quick changes to lighting and camera setup so as to record the scene from a number of different angles, as is commonly the case when constructing a narrative in the film and television industry. I was very happy with the way the light illuminated Birren’s face. It was a great candid moment that I had to create within just a few seconds. After that the moment was gone. Jake by the spotlight at the end of an evening filming on location near Buronga in NSW for the Australian motion picture film Summer Coda. Jake is a local Mildura lad who joined the Summer Coda team at the beginning of his foray into the Aussie film and television industry. The above image features Jake at the end of the day while the crew were packing away the camera and all the lights that were used to photograph a particularly beautiful scene that evening. I love the way that Jake is outlined by the light, which is raking over him from an extreme side angle. I used my then original Canon 5D camera and trusty Canon 24-105 mm f/4 L series USM lens at a focal length of 105 mm to make this photo. It’s a candid, on a busy film set, so there was no time to set up a tripod for the 1/13 second f/4 ISO 1600 exposure that was required to create the image. I achieved the juxtaposition of the warm and cool color contrast by processing the original image twice and then combining them into a new composite image. The blue color effect was achieved by setting my camera to the Tungsten (Incandescent on some cameras) White Balance setting that turned the light, which had been filtered to produce a neutral (i.e, white light) color, to blue. For the second version of the original image I simply employed the White Balance slider in Adobe Lightroom to produce a warmer color balance. The next step was to select both post processed versions of the original image, bring them into Photoshop and combine them, via masking, to control which areas of the final composite image were rendered warm and which cool.